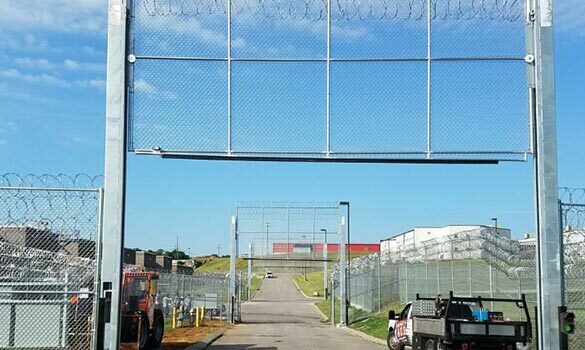 Institutional Fencing | Southern KY | Rio Grande Fence Co.
From local jails and prisons to state penitentiaries, mental health facilities and juvenile justice centers, Rio Grande Fence Co. of Nashville has been counted on time and time again to install quality fence solutions for the most demanding facilities in Tennessee. Most institutional fence consists of galvanized chain link fence with multiple razor ribbon deployment systems for the exterior fence, with a separate galvanized chain link fence on the interior. We have installed institutional fence in Memphis, Jackson, Clarksville, Nashville, Murfreesboro, Knoxville and Chattanooga. From border to border in Tennessee, Rio Grande Fence Co. has been hired to install fences based on our professional reputation, ability to deliver with our man power and equipment, and the ability to bring great value to our customers’ security needs. We are here to help you with your next institutional fence project.